Originally launched in 1996, Skyway has developed into an authoritative voice, examining in depth the major challenges to improving air traffic management performance in Europe and globally. Skyway magazine is published every four months, in hard copy and electronically on the EUROCONTROL website. 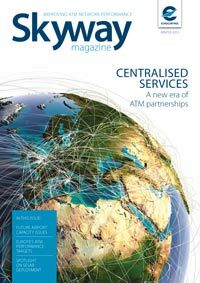 EUROCONTROL is the European ATM system’s network manager and Skyway, the official journal of the Agency, is circulated to the key decision-makers in Europe’s ATM community and beyond. It is a unique, authoritative guide to the most important technological, operational and institutional changes which are impacting the ATM system. It gives readers a vital understanding through interviews, news, data and features of how the performance of Europe’s ATM system is being managed and the views and strategies of the individuals leading the change. Skyway editorial covers all aspects of EUROCONTROL’s operational and regulatory initiatives in both civil and military spheres, from improving communications, navigation and surveillance operations within the continent to ensuring Europe’s ATM system is interoperable within a global ATM framework. EUROCONTROL’s unique impartial position within the ATM community gives readers an unparalleled access to expert and invaluable sources of information on changes within the industry. News about the agency is followed by flight and ATM performance data which tracks and forecasts the latest industry trends in terms of traffic and ATM performance. The features section analyses the performance improvements underway within the continent and within the wider ATM world. It gives readers a valuable, objective overview of the institutional, technical and operational changes which are taking place throughout Europe. The “viewpoint” section allows key decision makers from all sides of the ATM and wider aviation sector to give their opinions on the challenges and solutions facing Europe’s ATM system.